CHIMNEY ROCK, NC (March 23, 2015) – Few sights in the Blue Ridge Mountains are as spectacular as watching the sunrise over Lake Lure from Chimney Rock. Some visitors call it a spiritual experience. 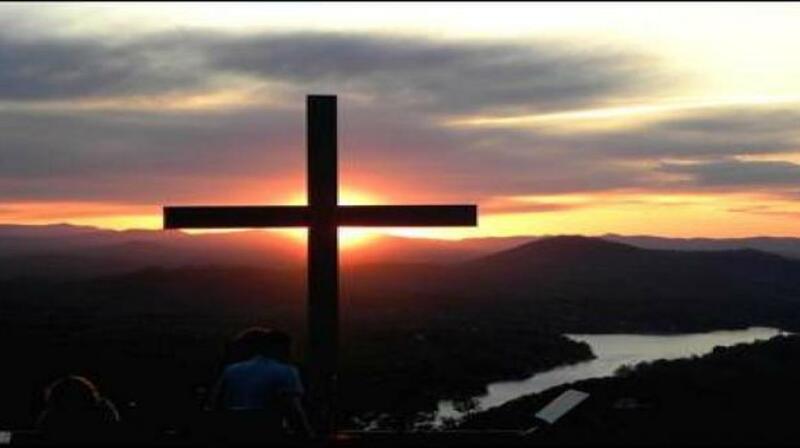 This year Chimney Rock at Chimney Rock State Park is hosting its 60th Annual Easter Sunrise Service, which attracts more than 1,000 early risers from around the Southeast each year. The interdenominational community celebration on April 5 includes live spiritual music by local musicians, an inspirational message and – with some cooperation from above – a beautiful sunrise with 75-mile views. The public and media are invited to attend with free admission for the 6:30 to 7 a.m. Easter service, held rain or shine. The Park gate opens 5 to 6 a.m. for the service on the top parking lot below the Chimney. Guests are encouraged to arrive early, as no admittance to the Park can be allowed past 6 a.m. Stay to enjoy the Park all day, or drop in for a breakfast buffet at the Old Rock Café and return for free readmission with both your receipt and Easter program. The Park is open for its regular hours, which began March 8, from 8:30 a.m. to 7 p.m. with the Ticket Plaza closing at 5:30 p.m.
“If you’re looking for powerful inspiration and a sense of community, this is it. Our annual Easter Sunrise Service is a special tradition for our guests… a memorable event for the entire family,” said Mary Jaeger-Gale, General Manager at Chimney Rock at Chimney Rock State Park. Rev. David MacEachern, pastor of Bat Cave Baptist Church, is coordinating the music and service. Several other pastors from area churches are participating. The Easter service will feature bagpipes and special live music sung by local musicians, Park staff and their family members. It will air live on 1450 WHKP-AM Radio and be rebroadcast at noon for those unable to attend. Attendees are invited to a breakfast buffet at the Old Rock Café from 7-11 a.m. for only $9.99 for adults and $6.29 for children ages 10 and under, including beverages (with the exception of alcohol).